What do you do with a nasty looking shrunken skull mug? Make a Shrunken Skull of course. This Vintage Shrunken Skull mug was originally sold at the Mai Kai in Ft. Lauderdale, FL where they served up this dangerous drink in this very mug. Today there is a new version of the mug with the tattoo all glazed. What makes this mug so special is the Cold Paint that was hand painted over the glaze. Of course the paint was susceptible to chipping and this savage shows some wear and tear, but hey, he’s been around for a while and thankfully I rescued him from a thrift shop for 0.29. Normally I would never drink from a vessel so valuable, but I had to pay tribute to him after rescuing him from that nasty thrift store. And what more appropriate way than making the very drink served in him for so many years. This version comes from Jeff Beachbum Berry’s essential tome Grog Log. 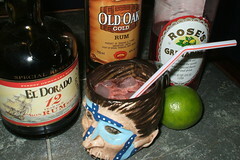 Shake like hell in a shaker with ice and pour the entire contents in a skull mug. Now that’s a killer drink.